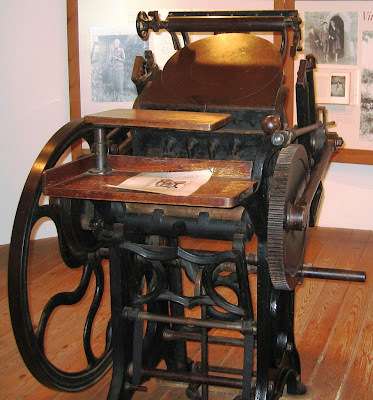 They recently published a painting called The Printer c. 1915 by Laura Sylvia Gosse (1881-1968) and asked: "Can anyone tell us if this unwieldy looking machine is the same kind of thing as the 'small handpress' Leonard and Virginia Woolf bought in Holborn one March afternoon in 1917 in order to set up the Hogarth Press?" 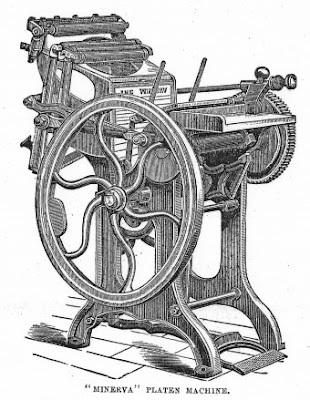 Well it was not as large and unwieldy as the image in The Printer, but it was a good-sized platen jobber, probably the Minerva. There is some confusion as Leonard Woolf wrote in a letter that he believed the press was an "Eclipse model" which was a much smaller press. The actual Hogarth Press press now resides at Sissinghurst Castle. When Vita Sackville-West and Harold Nicolson bought Sissinghurst, Leonard and Virginia gave them the press as a housewarming gift. It was the first piece of furniture installed at Sissinghurst. Richard Kennedy began working at the Hogarth Press at age 16 and worked there from 1926 to 1930. In the above drawings, Virginia Woolf is seen setting the type for Herbert Palmer’s poems. 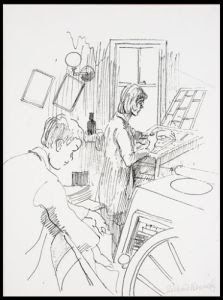 In 1972 Kennedy compiled his memories and drawing of that time into a book entitled, A Boy at the Hogarth Press. 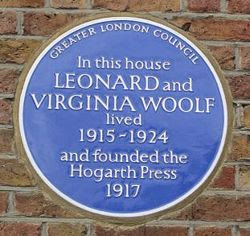 During the heyday of the Hogarth Press 525 books were published. Of those books only a scant 34 were actually published on the platen jobber. The rest were published by commercial publishers. 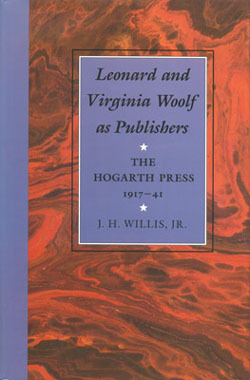 If you are interested in the Hogarth Press, J.H.Willis published an exhaustive study entitled Leonard and Virginia Woolf as Publishers: The Hogarth Press, 1917-41. I love the style of Virginia Wolf, she is the most incredible writer ever born.